The only thing I love more than stumbling upon good food is stumbling upon good food that has a great story. 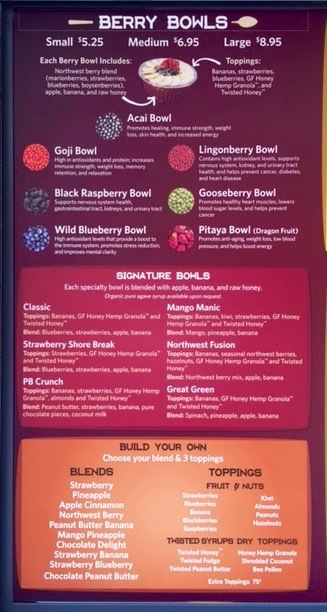 I was invited to try The Bowl & Berry, which I was super excited about because I know there aren’t many places that offer Acai bowls. I know they have been trendy in California for quite some time, but not so much here in Oregon. With all our fresh berries I have to wonder what has taken so long. Thank goodness George Fox University is cranking out some business majors with big dreams, appetites for good food and all the knowledge they need to start a business at a very young age. 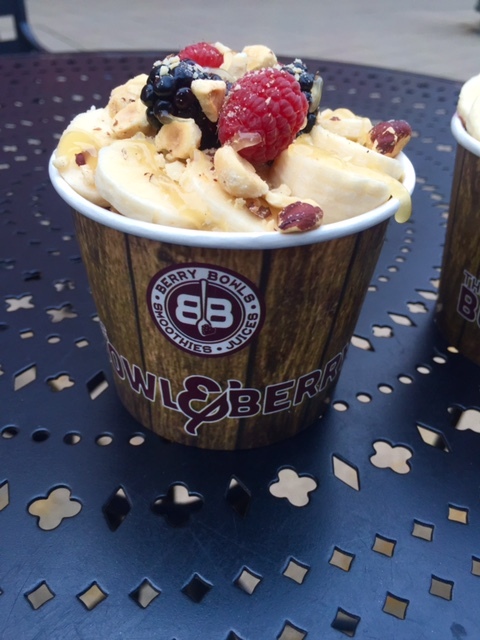 You maybe be wondering what an Acai or Berry Bowl even is? You should be since there aren’t many in the area. Inspired by the popular acai bowl, we’ve created a true Pacific Northwest original. Our signature bowl is a thick smoothie blend of our 100% Northwest berry mix (marionberries, strawberries, blueberries, boysenberries), topped with fresh granola, raw honey, and adorned with various fresh fruits. 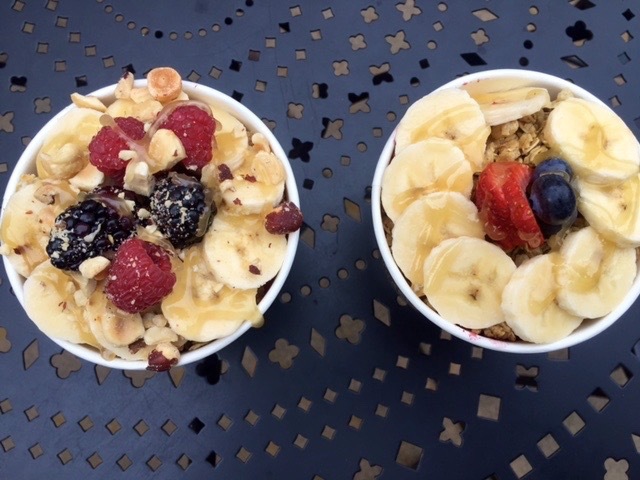 All of our berry bowls, smoothies, and freshly squeezed juices are made from local and organic ingredients whenever possible and are free from gluten, dairy, egg and soy. We believe in the life-changing benefits of eating well and having that option for the whole family. Out of all the choices I chose the Acai bowl and it was fantastic. The acia berries have such a great flavor (kind of similar to a blueberry, but not really) and the bowls are so refreshing and the toppings give it great added texture and flavor. My husband got the NW Fusion with Hazelnuts. His was great as well and just enough different because of the different berry blend. She said the most popular bowl was the PB crunch. I saw a few things on the menu that I was choosing between, so another trip is definitely in order. Just part of the menu from the Bowl & Berry. 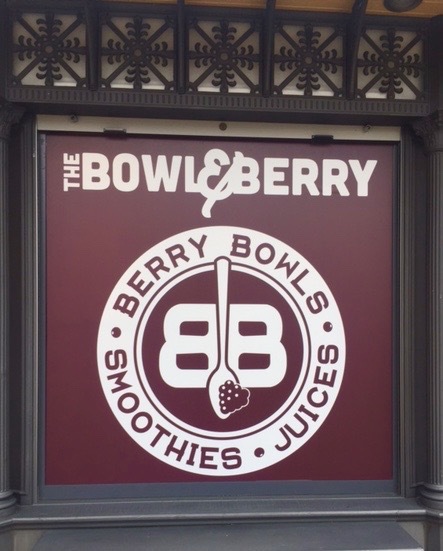 Stop by to check out their juices and oatmeal bowls too. I love that we have another locally owned eatery in the burbs that is not a chain. She is very close the ever popular Koi Fusion at Bridgeport. There is more than one owner, but the one I met with was the dreamer behind bringing the product from her home state of Hawaii. She is passionate and excited about what she has created and you can tell. I love that she has a team behind her who believes in her and the product, and are supporting her in making this happen. Pricing was $5.25-$8.95 depending on size. All local berries, organic when possible and loaded with ALL good stuff. Service was great. Each one is made fresh, so they do take some time to make them. Drinks include Juice blends and Smoothies. Atmosphere and Location: There are two locations. The one I went to was at Bridgeport Village in Tualatin/Tigard. It is located in a kiosk, but there is heated outdoor seating nearby. The second location at Bethany Village has indoor seating.